How to refinance your student loans, for lawyers, professionals—and anyone who wants to save money! 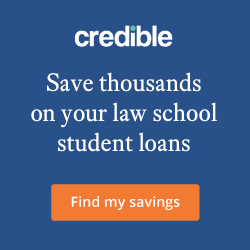 So you want to get rid of those law school loans? 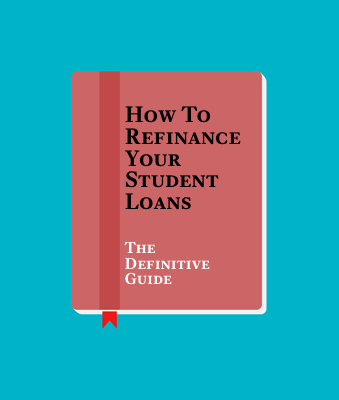 This Student Loan Refinancing Guide includes what I learned spending hundreds of hours negotiating and searching for the best deals to refinance your law school loans (or any loans really). 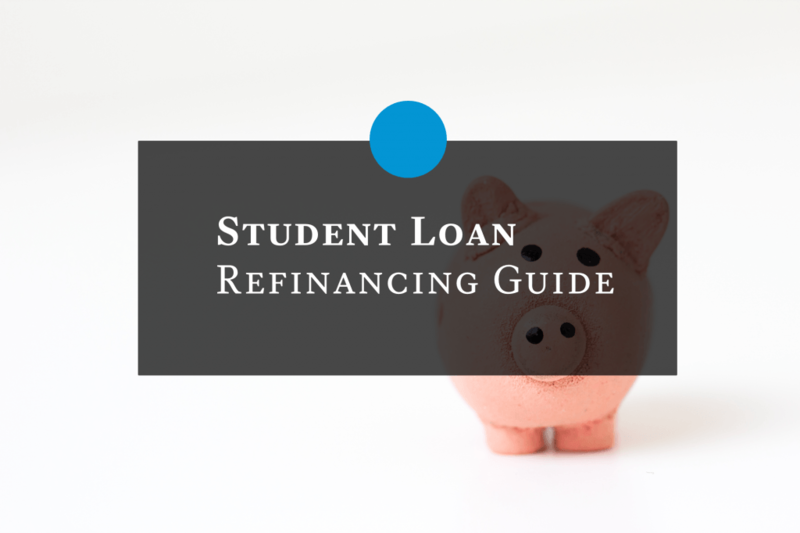 When I decided that I wanted to create a guide to refinancing student loans, I got pretty obsessed meticulously researching and hunting for the perfect deal. I remember the time before I paid off my $190,000 in student loan debt and all I wanted to do was get them paid off as soon as possible. Although I recommend reading this guide from the beginning, use the menu below to jump to the section that interests you most. Note: I’ve negotiated a special deal for our readers. If you use these links, you will get the bonus and you’ll help support the growth and development of this site. How Long to Pay Off? Refinancing your student loans is one of the best things you can do when you graduate assuming you aren’t seeking loan forgiveness. Why? You’re paying thousands of dollars of unnecessary interest each year. That interest is keeping you from paying down the student loan balance. And the student loan balance is keeping you from building wealth. So, refinance those loans and start paying them down! Compound interest is a wonderful thing. Compound interest in reverse will kill you. If you're paying an average 6.8% interest on your student loans, you need $566 a month for every $100,000 you've borrowed just to cover the interest alone. Plug your numbers into the calculator to see how much money you'll save by having a lower interest rate. When I graduated from law school, nobody refinanced student loans. When the original refinancing players showed up in 2013, there were lots of problems handling applications and processing a deluge of professionals interested in refinancing their loans. Those days are over. You can get a preliminary quote within five minutes. If you have all your loan documents together, it might take you another 15 minutes to submit the application electronically. I recommend you check around with all the different companies (pretty easy once you have your paperwork together) to get the best rate. Sometimes a lawyer is worried about refinancing everything at the same time. Maybe you have an attractive fixed interest rate on an undergraduate loan? There's no need to include it in the package that gets refinanced. Maybe you want to dip your toe into the waters but keep some of your loans in the federal program. There's no requirement to refinance student loans in bulk. Refinance the portion that feels comfortable and keeping moving. There's a reason the federal government sued Navient in early 2017. The federal student loan servicers have a history of customer complaints. Specifically, the government alleged that Navient "processed payments incorrectly; created obstacles by providing bad information and failed to act when borrowers complained." Having seen them set such a low threshold, you're likely to be impressed with a modern web interface, the ability to easily make extra payments and flexible policies. While no company is perfect, the student loan refinancing market is extremely competitive at the moment which means each company has to work hard to win your business. Many people mix up these terms. Consolidation is combining all of your loans into one federal loan. Unfortunately (for you), the government averages the interest rates of all of your loans and then rounds them up to the nearest 1/8th%. Refinancing occurs when a private bank or lender repays your federal loans and issues a new loan to you, typically at a much lower interest rate. Refinance. Don't consolidate. Refinancing is the first step in beating back the interest rate monster. But don't get confused into thinking that you've actually made progress in paying off your debt. Refinancing student loans is just the first step. While the $12,000 in annual interest kept you from making headway against paying down your federal student loans, it's the $200,000 of debt that you're going to have to pay eventually before you can build real wealth. To defeat the $200,000 debt, you're going to have to make consistent monthly payments and throw any extra one-off "bonus" money that comes your way as you're making payments toward your student loans. If you're just starting your career, you might not get the best rate due to your credit score and debt-to-income ratio. Or maybe you've paid off half your loan and are now convinced that a variable rate makes sense for the rest of the payoff. There's nothing stopping you from refinancing your loans again. You'll get the bonus money every time you do it and the refinancing companies probably won't care, since they'll have long ago sold your loans into the bond market. Refinancing is not right for you if you plan on having your loans forgiven under Public Service Loan Forgiveness (PSLF) or any of the income-driven repayment plans (e.g. IBR/PAYE/REPAYE). Forgiveness programs are only available to holders of federal loans. If you refinance, your federal loans are paid off and you now owe a private lender. Don't refinance if you plan on seeking forgiveness. Many lawyers are afraid of refinancing their student loans. What are those lawyers really worried about? They're worried they might not be able to make monthly payments. But if that happens, it's not like the student loan companies can repossess your brain. Student loans are an unsecured debt. If you stop paying, the student loan companies have limited recourse. They'll report you to the credit bureaus. But all the credit bureaus can do is lower your credit score. Your credit score is the least of your problems if you can't make student loan payments. If you're sure that you're going to pay off your loans eventually (and forgo seeking forgiveness), then it's time to refinance the student loans. Paying an extra $7,000 a year in interest so that you can return to REPAYE payments "just in case" is a very expensive insurance policy premium that doesn't seem worth it to me. You're already going to save tens of thousands of dollars in interest when you refinance. But I've got an even better deal for you: extra cash in your pocket. I've negotiated a special deal with each of the main refinancing companies so that you get a little extra cash back when you do (and you help support this site). Plus, when you refinance through one of our links you'll be part of The Biglaw Investor family. It's hard for a student loan company to ignore a customer that's literally refinancing millions of dollars in student loans (like us), so if you have questions (or need some extra help), you'll benefit from being a "big fish". We have dedicated contacts with each company. How long to pay off law school student loan debt? How much can you pay toward your debt each month? What is the total balance of all your loans? Can you accelerate payment by throwing "bonus" payments toward your loans? Can you generate extra income by increasing your salary or through a side hustle? You can't pay off your loan unless you begin making payments. Use this calculator to see how changes in your monthly payment change your total payments. With a little tweak to increase your monthly payment, your student loan will be gone in no time! Your credit score is only good for a few things. One of those is getting a good rate on your student loan refinance. You'll probably need at least a 650 credit score. If you have an average credit score, you will probably receive an average offer. Unlike when you applied for federal loans, the private market wants proof that you'll pay them back. Showing work experience lessens that risk. If you've been employed for over a year, you'll likely get a better rate than if you haven't started your first job. Keep an eye on current market interest rates. Interest rates have been at historic lows, but when the Fed Chairman speaks, you should be paying attention to make sure you're ahead of future interest rate increases, especially if you want to lock in a fixed rate. Adding a cosigner is good for you but bad for the cosigner, since they'll be on the hook for the loan too. Make sure you understand what happens if you or your cosigner dies. A cheap life insurance policy on you is well worth the cost if your loans aren't forgiven upon your death. Again, these aren't your Department of Education "no credit required" loans. The private lender is going to want to know you can make monthly payments and they'll determine that by looking at your debt-to-income ratio. If yours is high, you may not get the best rate. Be sure to compare multiple lenders to find the best offer on the market. Lenders have different underwriting models that determine your loan eligibility, so use that to your advantage. Apply to multiple lenders to see what rates you are offered and find the one that is best for you. The student loan refinance companies are offering you great interest rate savings, but there are a few things you need to keep in mind as you refinance your loans. Giving up the federal loans means you'll no longer have access to the income-driven repayment plans (like IBR, PAYE or REPAYE) and PSLF. However, as the student loan refinance market matures, many companies are beginning to offer protections similar to those offered by federal loans. Just keep in mind that those income-driven repayment plans will be gone forever, as well as the option for forgiveness via PSLF. The below list are some important student loan considerations to keep in mind as you refinance your loans. Are Your Student Loans Dischargeable Upon Death? You might not think your student loans matter if you die, but you should know whether they are dischargeable upon your death. Otherwise, your cosigner, potentially your spouse or your estate could be on the hook. If that doesn't fit into your estate plans, this shouldn't keep you from refinancing. Either refinance with a company where your loans are forgiven upon your death or use some of the thousands of dollars in interest saved to buy a cheap term life insurance policy in the amount of your student loans. A healthy 30-year-old male can get a $150,000 10-year life insurance policy for as little as $120 a year. For years it was impossible to consolidate federal and private student loans. In fact, it's still a student loan myth that you can't combine federal and private student loans. All of the private student loan companies will refinance both your federal and private student loans. Keep in mind that you're not required to refinance all of your loans, so you can pick and choose what makes sense to you. When you refinance your student loans, you're going to have to pick a term length (probably 5, 7, 10 or 15 years). The longer your term, the higher the interest rate. This is because the longer the term, the more risk you are transferring to the lender that you might not pay back your loans. It doesn't make sense to pick a longer term with lower monthly payments if you plan on aggressively paying off your loan "just in case" you have one month where you can't make payments. Generally, if your plan is to pay off your loans aggressively (i.e. 2-3 years), you should go with the shortest term possible. On the other hand, if income is tight at the moment, you should choose a longer term with a lower monthly payment and then just work to pay off the loan as quickly as you can. Many lawyers think of refinancing their loans in absolute terms. But the reality is that as soon as you refinance you have the option to refinance again. If your circumstances change and you want to switch from a variable to a fixed interest rate, it's not going to be hard to do so assuming you still have good credit and are employed. For that reason, it's important to remember to be flexible with your outlook on your student loans. If something isn't working right for you, the chances are high that you'll be able to renegotiate in the marketplace and get terms that are better for you. Now that you've decided to refinance your student loans, you'll have to decide whether to take on a variable interest rate or a fixed interest rate. There's no right answer. Choosing between a variable and fixed interest rate is a personal decision. If you're going to pay your loans off quickly, a variable interest rate is probably better. If you're on a tight budget, you might prefer a fixed interest rate. Is a Variable or Fixed Rate Right For You? Deciding between taking a variable or fixed interest rate is deciding between which party should take on the risk when and if interest rates go up. If you take on the risk (by choosing a variable rate), the bank will pay you for it by offering you a lower rate. If you want the bank to take on the risk (by choosing a fixed rate), the bank will charge you extra by offering you a higher rate. Therefore, the difference between the variable and the fixed interest rate represents the price of the risk according to the bank. That makes it easy for you to decide who should take on the risk. Consider $100,000 of student loan debt. The bank offers you either a 3.25% variable or 4.50% fixed interest rate. At a difference of 1.25% (4.50% - 3.25%), the price of the risk is $1,250 ($100,000 x 1.25%) per year. I like to think of the $1,250 annual payment as an insurance policy premium. Do I want to pay $1,250 to the bank for insurance in case rates go up? Like any insurance policy, you should think about the chances of whether or not you'll use it. Generally, I'm not in favor of paying for insurance I don't need. If you expect to pay off your loans in 1-3 years, it's unlikely that interest rates will rise fast enough to make the fixed interest rate attractive. By the time they do, you'll have paid off a substantial portion of your loan. On the other hand, if you expect to pay off your loans in 10 years, you may prefer the certainty of a fixed rate. Keep in mind that there is nothing that prevents you from refinancing again in the future, so you can start with a variable rate today and switch to a fixed interest later (or vice versa). Use the calculator in this section to compare different scenarios. Predicting interest rate movement is impossible. If interest rates move neither up nor down as you pay off your student loans, you'll do better with a variable interest rate. This is because variable rates are typically 1-2 percentage points lower than the fixed rate available to you. If interest rates rise slowly, the variable rate will likely be the better deal. You’ll benefit from the lower variable rate while your balance is the highest. By the time your variable rate passes the fixed rate you will have made a lot of progress on paying off your student loans. If interest rates rise quickly, you could find yourself paying more interest than you would have had you taken the fixed interest rate. Keep in mind that many loans are capped at how quickly the rates can rise each year. If interest rates move down as you pay off your loan, the variable interest rate loan will be the clear winner. Look no further than Japan to see an example of an economy in a sustained low-interest environment. Once you refinance your loan, you still need to pay off the debt. But sometimes the debt can feel like an immovable mountain. So how will you do it? One payment at a time, like everyone else. Below are some ideas for how you can accelerate your debt payoff if you want to get it over with as fast as possible. If you want to set yourself up for a solid financial life, you really only need to do one thing once you graduate. Grow into your income slowly. When you’re fresh out of law school, you’re already used to being poor so it's not going to be hard for you to keep living at the same standard. If you can continue that lifestyle for the next 3-5 years, you can devote the extra money to pay off debt and build retirement savings. You can do this automatically by doing things like maxing out your 401(k) or having a fixed "paycheck" deposited each month in your checking account with the rest going to student loans. The conventional advice is that giving the government an interest-free loan is stupid. But I like our government. And I like when employees set their withholding exemptions to 0 on a W-4. You’ll end up with a big fat IRS refund check every Spring. When you get that check, you can either throw the whole thing toward student loans or make a contribution to your Roth IRA. It’s much easier to make one good decision each Spring than it is to make 26 good decisions each year. Lawyers may not have a lot of options for practicing law on the side, but there’s nothing keeping you from picking up some side hustles on the evenings and weekends. If you want to accelerate your debt payoff, the little one-off “extra” payments make a big difference. Some of your peers are driving for Uber on the weekends, pet sitting on Rover or renting out extra space on AirBnB. If you really want to motivate yourself, create a physical item that represents your debt. Back when I was paying off $190,000 in student loan debt, I created a debt chain where each link represented a fixed amount of debt. For every $1,000 of debt paid down, I removed one link from the chain. Those days of cutting off links from the chain and throwing them into the trash were very motivating. Having a physical reminder and watching it get smaller over time is a great way to reward and motivate you to make faster payments on the debt. The student loan refinance market is white hot. The competition means that you have many companies competing against each other to offer you the lowest rates. I've scoured through all the major players and created the list below to help you get the best deal possible so you can pay off your student loans. To make sure they were legit, I either met with these bankers in person or had calls with them to learn about their business. CommonBond was founded in 2012 by business school graduates frustrated with high rates and poor service. Based in NYC (I’ve met with them), they also have a social promise component to lending where for every loan they fund they also fund the education of a student in need in partnership with Pencils of Promise. A unique feature of CommonBond is that you can refinance Parent PLUS loans, so if your parents took out loans on your behalf you can get good rates for them too. CommonBond offers temporary forbearance for economic hardship in certain circumstances, similar to federal loans. As a Biglaw Investor reader, if you use the links on this page, you get an extra $400 in your pocket when you refinance with CommonBond. Earnest holds a special place in my heart as the company that refinanced my student loans and saved me from the vicious 6.8% federal loan interest rate. While those $190,000 in loans have long been repaid, Earnest is still working in the market to save other lawyers money. Earnest has a few unique features like being able to pick the exact amount of your monthly payment or switching between a fixed and variable rate at no charge during the life of the loan. Earnest makes it easy to pay off your loans early with a clean and simple backend, plus they offer protection for your family with loan forgiveness in the case of death. 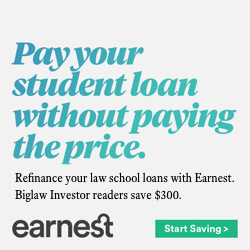 As a Biglaw Investor reader, if you use the links on this page, you get an extra $500 in your pocket when you refinance with Earnest. 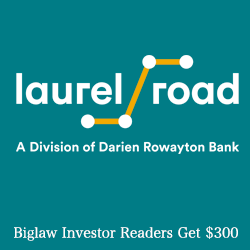 Laurel Road (formerly Darien Rowayton Bank (DRB)) is a Connecticut-based bank that was one of the first to recognize the opportunity to refinance student loans. When it first got started, the bank was overwhelmed with applications from graduates looking to get better rates. Still one of the huge players in the market, they are often known for providing one of the lowest rates of all companies. I'm excited to see them spin out the student loan group into a new company. If you apply via the links on this page and close a loan, you’ll get paid $300. Credible is the “Kayak” of student loan refinancing. Rather than lending you money themselves, Credible will connect you with other lenders (most of which aren’t on this page) such as CitizensBank. When you apply through Credible, it’s like applying to 8 different lenders at the same time which is another good option if you’re looking for the best rate possible. 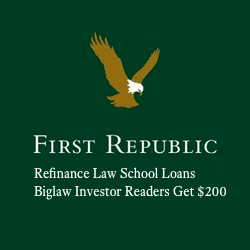 As a Biglaw Investor reader, if you use the links on this page, you get an extra $1000 in your pocket when you refinance with Credible if you refinance over $100,000. 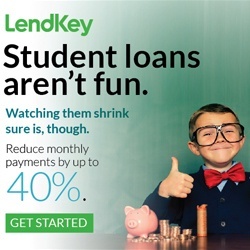 LendKey uses a network of credit units and local banks (over 300) to refinance student loans. After you enter your details, the LendKey system matches you with all eligible offers based on your location and the various lenders underwriting standards. From there, you’re free to select the lowest rate or a bank where you already have a banking relationship. As a reader of The Biglaw Investor, if you use the links on this page you will get an extra $300 in your pocket when you refinance with LendKey (which you can then use to pay off your loan). 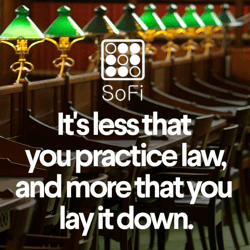 Started in 2011, SoFi is the original player in the student loan refinance market. They’ve refinanced billions of dollars of student loans since creating the industry. SoFi is starting to branch out with additional financial services, such as mortgages, personal loans and life insurance. If you refinance with SoFi through a link on this page, not only will you be supporting The Biglaw Investor at no cost to yourself, but you’ll also get paid $300. Citizens Bank is the second biggest player in the student loan refinancing market. Most of their refinancing is done through relationships with existing customers, but they're always looking for new relationships. I've had multiple readers tell me that Citizens Bank offers competitive rates and that they appreciate being able to refinance their loans with the same bank they use each day. 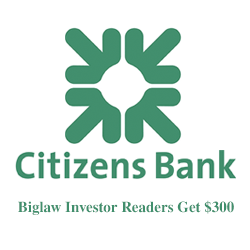 As a Biglaw Investor reader, if you use the links on this page, you get an extra $400 in your pocket when you refinance with Citizens Bank. Note that the link will take you to Credible where can choose to apply directly to Citizens Bank. Education Loan Finance is a new player in the student loan refinancing market, backed by the assets of SouthEast Bank, a Tennessee State chartered bank. 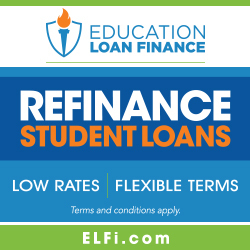 ELFI refinances student loans across all 50 states. By having access to deposits like a traditional bank, ELFI can offer low rates given their ample access to capital. Loan amounts start at $15,000 and up for qualified borrowers and ELFI offers their low rates even without the automatic payment discount that many lenders offer. If you apply using the links on this page, you'll get paid $350. First Republic offers the lowest rates I’ve seen. They’re looking to start a long-term financial relationship with you and the good news is that if you qualify, you’ll get the advertised rate (there is no other rate). Unfortunately, they only lend to borrowers who live near their branches in California, NYC, Boston, Greenwich, Portland and Palm Beach FL. In order to get the negotiated Biglaw Investor deal, email me via the contact form with the words “First Republic Referral” in the subject line or contact my banker, Kerry Berchtold at 310-772-1986 or [email protected] and let her know you were referred by The Biglaw Investor and she’ll take care of you. 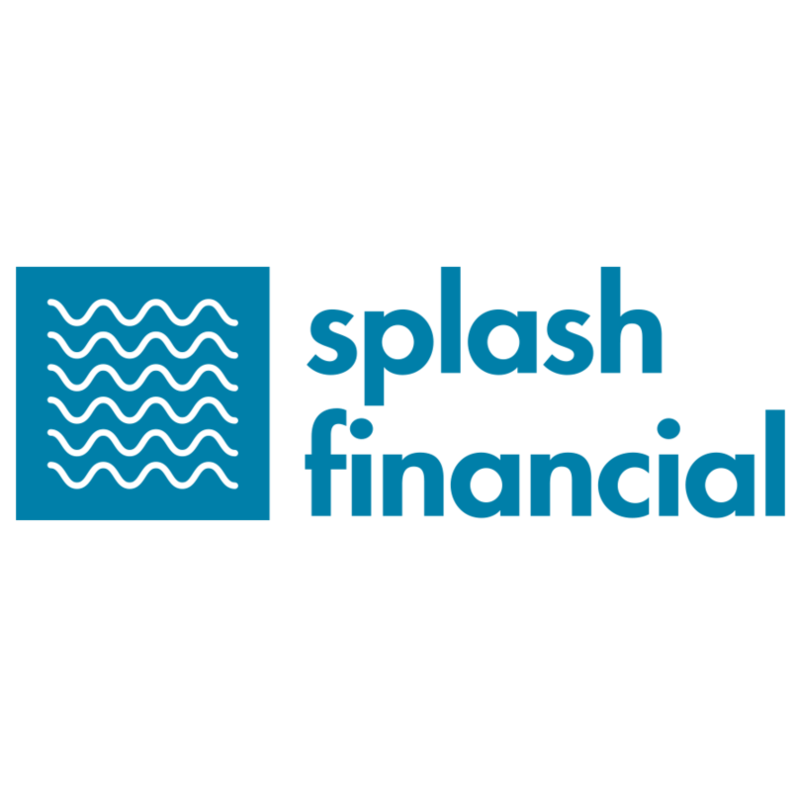 Splash Financial is a new player based in Cleveland, Ohio that can provide you an accurate rate estimate without pulling your credit. Assuming your actual credit score equals the credit score you enter in their calculator, you should expect to get the actual rate they quoted. Their loans are provided by PenFed Credit Union. Loan amounts start at $7,500 and up for qualified borrowers and no co-signor is needed if your income is above $42,000 and your credit score is 700 or above. If you apply using the links on this page with a loan greater than $30,000, you’ll get paid $300 which you'd be smart to use to pay down your loans. I’d like to hear what you have to say: What did you think about the guide? Contact me and let me know. I hope you found this guide valuable and I hope you enjoy getting some cash back from these companies. If you ever have any problems, remember that you’re part of The Biglaw Investor “family” now, so let me know and I’ll get you in touch with a rep from your particular company immediately.